Nothing was just one thing; there were worlds within worlds. Those of us who trod the line between were blessed and burdened with both. Shadow Scale picks up where Rachel Hartman’s wonderful Seraphina left off: the peace between humans and dragons in the kingdom of Goredd has been disturbed; a civil war between the old Ard of dragons, who refuse any contact with humans, and a more progressive branch is wrecking havoc among dragonkind; and Queen Glisselda is doing her best to keep her city and her people safe from the mounting threat. Seraphina, a talented court musician and close friend to the Queen and the Prince, is herself half-dragon. The ityasaari have always been stigmatised in Goredd, but Seraphina believes they may hold the key to peace and balance between her two people. When war breaks out, she decides to travel to other lands — to Ninys, Samsam, and to Porphyry in the north — to find the other half-dragons like herself, with whom she’s always had a mysterious mind connection. But Seraphina is not alone in her desire to bring the ityasaari together: soon she realises that a dangerous person from her past has the same goal as she does, which causes her to take a second look at her hopes, her motivations, and the unspoken assumptions they rely on. Not only that, but this person, Jannoula, poses a serious threat to those Seraphina holds dearest. How can Seraphina keep herself and those she loves safe, and prevent a bloodbath among dragons and humans alike at the same time? I loved this book so much. Shadow Scale may have surpassed The Just City as my favourite read of the year so far. I desperately want you to read it too, but you do have to read Seraphina first — I don’t think it would work as a stand-alone. The good news is that the only challenge this poses is one of time commitment, because Seraphina is every bit as wonderful a novel as Shadow Scale. You know you want them both in your life. 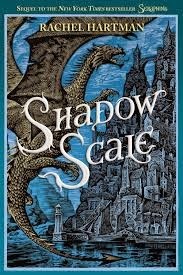 Reading Shadow Scale gave me the same feeling as reading The Goblin Emperor did last year: both are novels that examine complex and pertinent political ideas via incredibly rich secondary worlds, both have real darkness in them but nevertheless resist cynicism, and both were reminders of why I love genre. As the quote I opened with indicates, Shadow Scale is very much concerned with shifting categories, and with what resisting complex and flexible definitions of what it means to belong to a group can do to both individuals and societies. Throughout the novel, Hartman deftly examines her characters’ assumptions about being human, a dragon or a ityasaari; about gender and its expression; about belonging to the nations of Goredd, Ninys, Samsam, or Porphyry. Characters run into trouble when they refuse to embrace flexibility and accept that who they are — and who those around them are — is not set in stone. The most glaring example is the Old Dragon Ard, who clings to a rigid definition of dragonhood that doesn’t do justice to the experiences of real individuals. The second-generation dragons of Porphyry offer a fascinating counter-example: they’re the children of dragons who were exiled from their people for behaving “too much like humans”, and they grew up to call the human city-state where they live home. Their culture is not a carbon copy of traditional dragon culture, but it’s real, it’s theirs, and it’s as legitimate a part of what it means to be a dragon as anything else. Policing their right to define their dragonhood in their own terms leads to nothing but trouble for everyone. I’d set myself up as the rescuer of someone who didn’t want rescuing—or need it, to be brutally honest. Who was I to burst into this woman’s life and tell her I knew better than she did what she had suffered and how she should fix it? I had framed my quest, this gathering of ityasaari, as an act of compassion, but it wasn’t, really. Not if I set myself apart, as some hero to save them. It was impossible to see someone else’s pain from that distance. Maybe I hadn’t wanted to see it. Maybe I’d wanted them to see mine, or to reflect and affirm it like a mirror. That, or something like it, had been my dream, too. I felt a little queasy. Fortunately, while Jannoula takes using people to its final consequences, Seraphina is willing to listen, to let her fellow ityasaari tell her what they want for themselves, and to respect it even if it goes against her hopes. She treats them like individuals whose desires and self-determination matter, which of course has to be the basis of any real community. Anything else can only lead to Jannoula’s terrifying approach. I can’t talk about Shadow Scale’s theme of complex categories and self-definition without mentioning the gender system in the city-state of Porphyry, which Hartman discusses in this guest post at Fantasy Café. The Porphyrians have six genders; rather than making assumptions about how to categorise people they don’t know intimately, they politely ask, “How may I pronoun you?”. Imagining and exploring different workable ways of organising the world is one of my favourite things about SFF, and Hartman achieves that particularly well in this novel. Additionally, Shadow Scale features a trans woman in a key role; as Memory notes, it was refreshing to see that the only person who refuses to respect Camba’s identity is the unambiguous villain of the story. I also loved the scene where Seraphina is forced to rethink her assumptions about Camba’s relationship with her identity as a trans women and as an ityasaari. Having previously observed Camba in a moment of despair, she assumed she was experiencing the same self-disgust Seraphina herself feels, for one of the two reasons. But Camba is from Porphyry, not Goredd; her context is different and so is her relationship with the several categories she occupies. Seraphina — and the reader — are therefore encouraged to think again. “Why?” I asked, my throat tightening. It was never my first instinct to tell anyone anything personal. Uncle Orma, my only confident for years, had been the one person who knew about Jannoula, and he hadn’t truly known. He couldn’t have understood how it felt. I forgot that other people might care what went on inside my heart. Friends, read these books. They’re smart, brilliantly written, set in a complex world you want to explore in mode detail, and peopled with multifaceted characters who will break your heart in the best possible way. They made me happy for so many different reasons, and I’m so grateful that they exist. They read it too: In the Forest of Stories, Rhapsody in Books, you? Well, you definitely made me want to get back into this book and finish it! I think I like the themes and messages of Seraphina/Shadow Scale more than I like the stories themselves, if that makes sense. I think Hartman has an amazing way with building worlds and complex systems, but I just don't know that she is as good on the character development front. BUT maybe I am wrong. Once I finish Schwab's book (which is also amazing with the world-building but has characters that appeal to me a bit more), then I will give Shadow Scale another try. I don't think you're the only one to feel that way, though it was the opposite for me - I fell hard for the characters and wanted to spend another 600 pages reading about them. It's not a matter of right or wrong, though - different people connect to books differently, blah blah blah :P I'll definitely pick up the Schwab at some point, btw, as you've made it sound amazing! I reread Seraphina and loved it even more the second time, but Shadow Scale didn't fully do it for me. I still loved the ideas of it so, so much -- more than Seraphina, possibly -- and the nuance of how Hartman deals with gender and romance and disability is awesome. BUT I didn't love the plot of the book, and I had a hard time keeping engaged with it. I was telling Aarti that the parts where Seraphina was dashing about trying to find all the ityasaari felt like the camping scenes from the seventh Harry Potter book. Just -- long. Really really long, and for a foregone conclusion a little bit, cause we knewwwww Seraphina was going to end up releasing her powers and being able to do the stuff we wanted her to be doing all along. HOWEVER, I was super into all the stuff about the half-dragons being the Saints. I am just sad it wasn't enough to carry the book for me. A lot of people feel that way, I think, which is surprising for me because I LOVE THIS BOOK WITH THE FIRE OF A THOUSAND SUNS. Or something :P I wanted it to be even longer! But yay, I'm glad we agree the ideas are awesome even if we feel differently about the execution. I can't believe I still haven't read this! I really must!